Where are all my shoe lovers at? Let’s talk about 4 of the hottest fall shoe trends this season. From boots to mules and leopard prints it’s all here! To top it off, I’m sharing a few of my favorite gals pulling of these trends. Animal Print: By now it is no surprise that animal print is everywhere. And yes, it even includes shoes. Leopard is basically a neutral and can be worn with anything. Here you see Merrick wearing leopard booties with a cardigan for a casual look. Mules & Slides: Mules and slides are bigger than ever, and I am actually loving the idea of mules for a holiday shoe! ShopBop has so many fun holiday mules with bows, glitter, and even velvet! Love how Kathleen wore her mules here with denim for a casual everyday look. Perfect for running errands if you ask me. Moto Boots: This may be my favorite trend along with animal print. I LOVE the moto boot trend. It’s edgy but still so chic. I personally love the idea of dressing moto boots with a floral dress. But, I love how Venessa wore her with biker shorts and a blazer, I don’t think anyone else could have pulled off this look other than this hot mama. 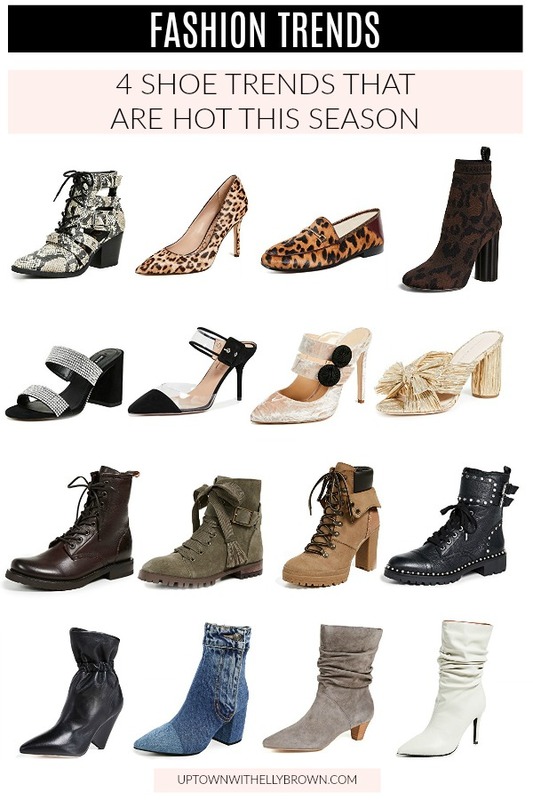 80’s-inspired Boots: I’m going to be upfront and say that this is not my favorite trend. I will probably avoid this trend as much as possible. I like things fitted, and slouchy boots are not for me (the furthest I could go is rider boots). Let me tell you one girl who I adore and rocks the 80’s-inspired boots like no body’s business, meet Krystal. What are your thoughts on these trends? Do you have a favorite? Share below! I sooo love those moto boots! If I could just wear them to work everyday that would be so great!